Many drivers often find that they have difficulty in finding the right loads in their area that prove to be beneficial for them instead of just being another batch of freight. With a long industry history of freight brokers, dealing with cargo middlemen and a rising number of online load boards, it can be difficult for a driver to efficiently and accurately find freight in order to continually keep themselves running. Amidst all of these driver resources, however, some sites are simply better than others, with drivers across the country who can speak to the positive experiences of using services. Getloaded is one of these freight boards, with an outstanding reputation for helping drivers succeed in within a trucking job and finding them the freight they need. What Exactly is Getloaded, Anyway? Founded at the end of the 1990’s in Virginia, Getloaded was one of the first online truck boards that served to help match drivers with the most ideal and most lucrative loads in order to make them the most outstanding drivers on the road. Over the years, Getloaded has grown in order to better serve the needs of drivers and those using it, expanding into more areas and promoting multitudes of loads as they opened up across the country. 2016 saw a merger between Getloaded and DAT Solutions, as the two load boards teamed up in order to offer a more wide array of loads to drivers across the country and to create a marketplace that is diverse in what drivers it may serve. In addition to the typical job board services, Getloaded has resources for drivers including fleet compliance, fuel taxes, and other issues that may be related to independent drivers and their individual trucker job. Overall, the site has a great deal of resources for drivers depending on their questions and needs, but its most important function is undoubtedly helping to assign drivers to specific loads that work well for them. How Do Truckers Benefit From This Service? The main way in which drivers see positive returns from using a job board subscription service is not necessarily seeing loads from all over the country, but seeing all the immediate opportunities that may be available in their area. Just about any driver in California, for example, can find an enormous amount of load offerings close to them from nearby towns of large cities. Taking Los Angeles as a model for this, there are hundreds of cities around one of the largest areas in the country that offer loads, whereas some drivers may only be looking at the larger hub, so to speak. The other advantage from using an online load board is when a driver works in a larger area such as Texas wherein a great deal of differentiated runs might take place. Using a load board can help an independent driver narrow down a more segmented and regular schedule as well, in which they may become more of a “regional driver” in their own right even though they are not associated with a company. Put simply, a service like Getloaded can provide users with one of the most powerful tools that a driver can have in their arsenal – discovery. Whether that discovery is personal or financial in nature, utilizing a load board is an excellent way to think outside the box. As Getloaded grew and combined forces with DAT, the company found the ability to create several different job boards in order to serve the needs of the vastly different brokers and carriers using their services. 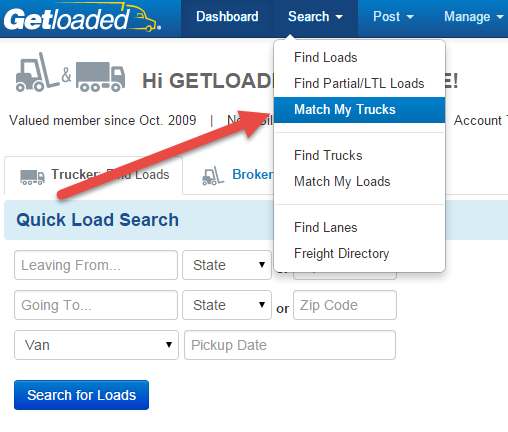 For drivers, however, DAT TruckersEdge and DAT Power are the two premiere services offered by the Getloaded site. With a differentiation in both price and the features in which the sites can offer, users can choose one board to fit their needs. DAT TruckersEdge: Starting at a more nominal price than the other service offered, this particular job board is oriented towards the owner-operator who is just starting out in the industry. This particular service helps orient a driver to the field of hunting through load boards by offering information and resources such as conditions related to weather and the road, as well as assisting in helping a driver map mileage and planning their routes. With a small fee for upgrading, drivers can also see the average rates paid for particular lanes within the last 90 days. This feature allows drivers who have little experience in negotiating loads get an idea of what is being offered, giving them an advantage in finding a price middle ground that is beneficial to all parties. DAT Power: For the more experienced driver, Getloaded offers DAT Power, a service billed by the company as “The Rolls Royce of load boards.” Known by many as the only “live” load board in the industry, users see their searches appear in real time, allowing for more time-sensitive dispatches. Another highly touted advantage of the service is the guarantee of payment up to $1,000, ensuring that loads are, in fact, beneficial to the person who takes them on. Whatever board a trucker or carrier chooses to use, they will undoubtedly find a great deal of offerings to fit their needs and to send them down the road with great pay. One of the primary reasons that drivers and brokers alike have lauded Getloaded are due to the results that it produces in addition to the simplistic and intuitive driver interface that it provides to users. The site is known for being an excellent tool for users who may be somewhat unfamiliar with the hallmarks and overall use of load boards, and a good primer for those who may also wish to work with live freight brokers as a potential additional revenue source. Getloaded offers the names of companies who need freight moved as well, giving drivers an opportunity in which they may research the company to see if they are a reputable source and perhaps to give them some sort of leverage in discussing price. Users can also see if shipping companies are reputable sources and prepare some preliminary customer service skills prior to speaking with a company. For shippers in particular, a site like Getloaded can also be a very powerful tool in providing networking abilities alongside financial opportunities. While owner-operators and other independent drivers can certainly reap the rewards of networking, carriers may have a unique advantage in establishing more profound relationships with companies who frequently need their goods moved. With a full fleet of trucks and boasting some resources, carriers may find a way to create some excellent synergy between their services. Can Getloaded Help a Driver Get Paid? While there may be no hard and fast guarantee in regards to a driver seeing immediate success or loads that provide a highly competitive paycheck, Getloaded is nonetheless an effective tool for a driver to put themselves in a situation where extra income may be found. Rather than dealing with a middleman in finding freight, drivers can simply subscribe for a service that shows carriers who are ready and willing to pay all across the country. By creating a nationwide network, Getloaded has also increased the value of owner-operator truck driving job positions across the country, bolstering an important career niche of the trucking world. Through the means of the site, independent drivers are not only able to be paid, but can sustain a career in whatever part of the country they wish to operate in. Furthermore, if a driver decides to move their operating area from Florida to the Northwest, they need not be dependent on a local freight brokerage source, as they can virtually access the load boards on Getloaded at any time they wish, wherever they wish. In short, this service is one of the most comprehensive ways for drivers and shippers alike to make connections and to further their driving careers while helping to serve the needs of commodities dealers. Drivers new to the industry and veterans alike can both utilize the offerings on Getloaded to begin their career or to sustain their career on the road. Allowing the person behind the wheel to make executive decisions about their career has made Getloaded a unique and highly valuable service in the digitally-oriented world that is modern trucking. While there is an inherent value in online resources like truck driver forums and other community-building sites for drivers, these sites may contain somewhat of a negative streak through them, with drivers extolling the multiple downsides of trucking that they have faced. With Getloaded, drivers are experiencing a wholly positive and beneficial aspect of the trucking industry as they are faced with encouraging opportunities wherein they may find themselves matched with a practical and productive resource to is an aid to the commercial trucking industry overall.